Next Thursday evening, Dominion will be releasing some improvements to the software that will help further streamline your payroll and HR processes. Please read on so you are fully aware of these updates. 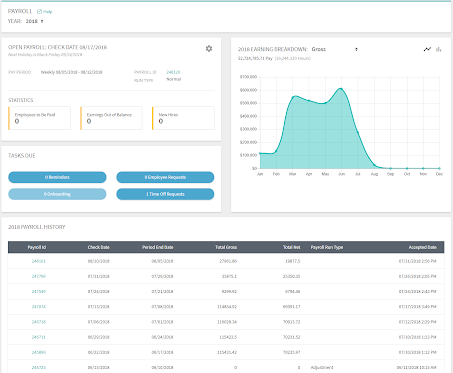 With this release, we will be implementing the first phase of the Payroll Dashboard to the main menu of the Payroll screen. This dashboard will provide you with a snapshot of some important information, including information regarding your current open payroll, a graph that breaks down your yearly earnings, any tasks you have due, and your Payroll History of the year selected. You should recognize this table from the former Payroll home screen. Previously, the screen contained a historical list of payroll check dates in both ‘open’ and ‘closed’ status. We’ve changed some of the column labels in the Payroll History table in order to be more intuitive. Additionally, we added a Calendar year picker at the top of the page to streamline the number of payrolls displayed at once. We will default to the current year but you can select any prior year as needed. We have improved the process for opening a payroll. Now, you will find a card at the top left of the dashboard that will reflect any open payroll that currently exists. If there is not an open payroll, there will be a button labeled ‘+ Payroll’ that will allow you to start one. This card will also inform you of any upcoming bank holidays, so you’re always in the know about when the federal reserve will be closed. If you do have a payroll open, we will display the general info from your payroll setup, including the current Pay Period, the Payroll ID, and the Run Type. You will also see three items listed out beneath ‘Statistics’: Employees to Be Paid, which links to the Payroll Paydata screen, Earnings Out of Balance, which links to the Payroll Totals screen, and New Hires, which doesn’t link to anything at this time but indicates whether there are any employees with a date of hire/rehire within your current pay period. The last thing you will notice on this card is a gear icon at the top right corner. This will take you back to the Payroll Control record so you can make any necessary revisions to your open payroll. This card will report at a glance any outstanding items that you need to complete before your payroll process can be completed. You’ll notice there are four buttons that indicate tasks related to your Reminders, Employee Requests, Onboarding, and Time Off Requests, respectively. At this time, Onboarding tasks will be disabled as it is still in development. The other three buttons will link directly to the source and allow you to complete the tasks as needed. The graph to the right is a high level Calendar year ‘Earnings’ graph. The data represented will automatically default to the current year selected at the top of the screen. If you change the year, the graph will reload with that year’s data. It will also default to reflect the Gross Pay, but all Earnings in your setup are available. Within the card we show the total pay and total hours for the selected year for the earning selected. However, the yearly earnings are shown as a monthly total for a month to month comparison. We also offer two chart options for the display of the data: a ‘bar’ and a ‘line’ chart. Each plotted point, on hover, displays the specific monthly value. Dominion values your feedback. The purpose behind creating this dashboard is to further enhance your experience within our software and streamline your processes. Do you have something in particular you’d like to see on this screen? Let us know! For Onboarding clients, there is an option at the bottom of this screen to select the employee to be included in onboarding if you are currently using the feature. If you do not use Onboarding, this option will not be available. (If you’d like to learn more about it, click here!) If Onboarding is elected for this rehire, our system will determine if a username for the employee exists. If a username is not found, our system will prompt you to create one as it carries you through this Onboarding setup. Any prior password will be reset during the Onboarding setup process. The rest of the Onboarding setup process remains the same, but be sure to audit your employee data to ensure all fields are covered for your returning employee. Please note that once a rehire begins the onboarding process again, the system will delete the original onboarding record. The system will not allow there to be two records for one employee. Dominion can now provide extra time to an employee's work day based on set conditions. Time & Attendance clients can set up a rule attached to a time policy that allows you to award attendance hours to employees as an added incentive. If you are interested in an employee policy similar to this process,contact our Client Solutions team for assistance. Want to see these updates in person? Register for a live demo on Friday, September 28th where Product Strategist, Lindsay Rankin, will walk you through all the updates and answer any questions you may have. Register for this demo here. In the meantime, if you have any questions about this release, please contact us at solutions@dominionsystems.com or by calling 616.248.3835.